BT is about to move from BT Yahoo Mail (which sucked anyway) to new BT Mail. 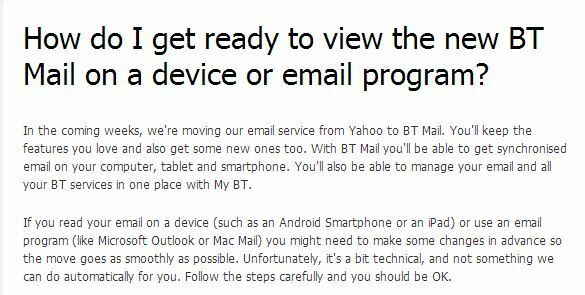 Most people are going to need to make some changes to their email settings in order to continue to use their BT email services. If you use an iPad, tablet, phone, Outlook, Mac, Windows Live Mail, etc, you’ll probably have to change the settings. As BT admit, “it’s a bit technical” and they can’t do it automatically. If you have read this far and don’t relish the thought of manually changing your email settings yourself, contact me now and I’ll make the transition as smooth as possible for you, and save you perhaps hours of frustration and phone calls to BT’s lovely call centre. If you want to make the changes yourself, look out for an email from BT and follow their instructions. I’ve looked at their instructions, and they’re confusing (even to me) and wordy. Good luck! My advice is to move away from BT email entirely. In fact, in my opinion, you should not use any email service provided by your Internet Service Provider. I’ll write another blog post soon about this, but contact me if you want to hear sooner.